I’ve been thinking a lot about the Shaftesbury Let’s Talk meeting last week. It was a shocking meeting. While I’ve done my fair share of heated public meetings, it’s the first time I’ve ever known all the heat and tension be generated by the people on the panel. And I am sorry for those who witnessed it. Looking at a dry list of the topics raised it was fairly typical of any Let’s Talk meeting (I’ve detailed some of them here, here and here): pavements, litter, dog fouling, planning, refuse collection, education, they all came up. The two specific issues that were new were the felling of Chestnut Avenue on Tooting Common and the proposed redevelopment of Northcote Road library and Chatham Hall. And these were the issues that ignited the meeting. I wouldn’t say it was particularly because those issues affected residents directly, but they touched a nerve. They spoke of a council that doesn’t listen and doesn’t respect local residents, a theme that resonated. The heat though, came from Cllr Senior. The second real question of the night was directed at Cllr Cook, as the executive member responsible for bull-dozing through the Chestnut Avenue decision, but it was Cllr Senior who jumped in, shouting down the resident. 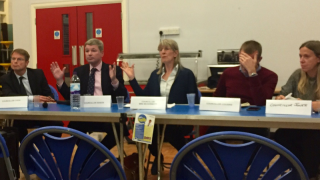 While there were Shaftesbury residents who were unhappy with non-Shaftesbury issues being discussed, they all expressed their discomfort and unhappiness with a totally inappropriate response. Sadly it set a tone for the night, with aggressive answers right up to the last question of the night (Cllr Senior once again shouting at a resident). I want to apologise for my part in it all. While I think my behaviour on the evening was fine, I cannot help but feel I played a part in getting there because the shouting, the ignoring, the lack of empathy from the Conservative councillors was reflective of the culture that exists on the council. My sins may not have been direct. I would hope I’ve never treated any resident with such disrespect (indeed, one resident who contacted me afterwards commented that he didn’t realise exactly how respectful I had been in our disagreements until he saw what could have been), but in all those years I was in the Conservative group or on the Executive I didn’t speak up. Perhaps it would have made no difference—in all probability it would not—but I can never know that because like everyone else I just kept quiet. So when Cllr Senior started his shouting or Cllr Cook spoke at length without actually addressing the question or showing any empathy I realised this was a symptom. They are coming from a culture in which people who disagree are never just people who disagree. They are somehow outsiders. The most frequent explanation is that campaigns are politically motivated. Since a right-minded person would support the council, it’s likely a Labour or Liberal Democrat (or ‘dog-killer’, as Cllr Senior calls them1) campaign. But in the case of the report back meeting it can also be literal outsiders, residents from Tooting or Northcote, because no-one from Shaftesbury would ever travel to Tooting Common, have an interest in trees or use Northcote library or have children at the nursery at Chatham Hall. There might be some benefit in this mentality; the sense of being separate from residents might promote impartial decision making. But it carries risks too. You’re more likely to dig in if you see it as a confrontation. And when you see others as somehow different it’s so much harder to find common ground or even the motivation to reach mutual understanding (which might still result in an agreement to disagree). I think those risks are now being realised again and again. So when the Let’s Talk meeting descended into shouting, it was clear to me that it was the result of Cllr Senior seeing opponents, not residents. The culture is corrosive. I was part of it. One of those that would keep quiet. Some of us would occasionally comment to each other about it, but we never challenged it and never raised it with someone who might be expected to tackle it. It was just the way it was. We all knew the culprits and perhaps that allowed us to relax knowing that while it might be a variant of “Boris being Boris” (before that was the UK’s brand of diplomacy) the majority of us were fine. What we failed to recognise was that it normalised the behaviour. So you’d overlook it, try to avoid situations where friends from other parts of your life interacted with those in politics, somehow not notice those Twitter accounts. But every time it just allowed a nasty culture to fester. Inevitably it has started to spill over into the outside world. Twitter has provided something of an insight into this, with local (anonymous) Tory accounts suggesting that female councillors should stand down or forfeit maternity rights, for example. And while the Shaftesbury Tory account was eventually shut down having over-stepped the mark once too often, the person allegedly behind the account was selected as a candidate as their reward. You can even see it in the council’s social media accounts, which were almost gloating as they gloried in the destruction of Chestnut Avenue. Or the phone calls to the boss of someone who dared question their decision and the slightly bullying tone of their response to the Wandsworth Guardian (we “simply” called someone’s boss, what’s wrong with that?). Organisational culture is incredibly difficult to change without strong leadership. My fear is that if the Conservatives retain control of the council in May 2018 (you can’t argue their strategy of a low council tax hasn’t delivered electoral results) the lesson they learn from events like the Shaftesbury Let’s Talk is not that their behaviour was wrong, but instead that their them-and-us analysis is not only correct and does not need to be addressed and may even be an asset. We won’t just have a nasty party, but also a nasty council. A bit difficult to represent residents as a ward councillor and “be separate from residents” at the same time… That’s challenging the principle of representative democracy. I was thinking more about when councillors have to act as decision makers (from planning, to trees, to everything else). If there’s that degree of separation it might make them less susceptible to bias. I accept it’s a weak argument. I have attended many of these meetings – in the past called “Listening to You”, after which the title was changed – possibly we we accused them again and again of not listening. The behaviour Cllrs. Cook and Senior is appalling. Shouting? When you say “they all expressed their discomfort and unhappiness” – how do you know this? Most people were silent and said no words at all in the meeting, and I can’t remember any polling occurring on the way out, asking us what we each thought. It was clear from what people themselves admitted or were overheard discussing on leaving, that some came to the meeting from Tooting or other areas outside Shaftesbury. This meant that a meeting designed for locals was diverted by too many who were not local. It doesn’t mean the issues of Tooting Common aren’t important or that people around Lavender Hill don’t care about anything beyond the immediate area, simply that it left you wondering if people have to go to Tooting or Northcote Road to raise issues directly about (for example) Shaftesbury schools or rubbish collection on Eversleigh Road. As a Governor of Shaftesbury Park school, you must have seen the irony in the screaming and abuse hurled around – if a teacher at the school experienced the same from a child there, would that be seen as acceptable by parents of other children whose class may be being disrupted? I’m sure it would not have been acceptable. Nor should it have been, really, from grown adults, no matter how passionately they felt about the issues. Personally I felt sorry for those who had hoped to hear more from the council officers present and for the person chairing the meeting, and all 3 of you Councillors, for whom the evening was pretty much a waste of time – it was disappointing you all didn’t show more support for the lady who was chairing the meeting….she wasn’t local, clearly, and you were one of her hosts – it doesn’t matter if you aren’t all from the same political party, you all had an equal duty to work together to make that meeting more productive. You yourself could have spoken out to make it a better meeting, and brought order to it, if you had wished to, but you didn’t. You could have done so if only for the sake of the officers who gave up their evening and sat patiently and quietly on the sidelines, there to serve the residents and councillors present without recourse to political point scoring.